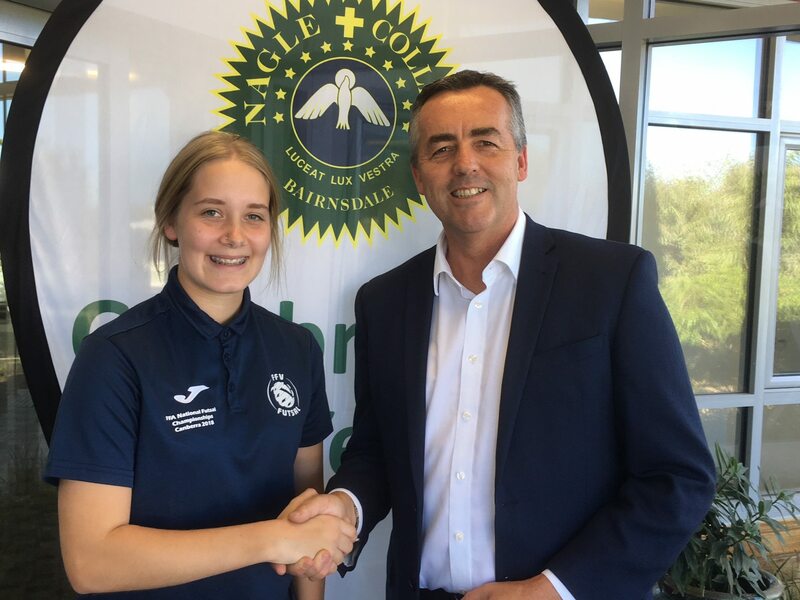 The Nationals Member for Gippsland Darren Chester met Bairnsdale’s Holly McCullagh to wish her well ahead of next week’s Futsal State Club Championships in Melbourne. Seventeen-year-old Holly McCullagh has been playing indoor soccer since she was seven and took up competitive futsal just last year. Already, she’s played internationally with her Melbourne-based team, the Bayside Pirates, and was selected to represented Victoria in the under 19s side at the 2018 Futsal National Championships held at the Australian Institute of Sport, Canberra, earlier this year. Next week, the year 11 student will be competing at the 2018 Futsal State Club Championships in Caroline Springs in Melbourne. Holly regularly catches the train to Melbourne for training and matches, and works part-time to save money to spend on her sport. To help with the cost of travelling to the national championships, Holly also received a grant under the Federal Government’s Local Sporting Champions program. The Nationals Member for Gippsland Darren Chester recently met Holly to learn more about the challenges she faced as a talented young sportsperson from Bairnsdale. “Holly’s story is a familiar one for many young people who live in regional areas. Distance from major sporting events and training venues can be a major hurdle for talented young sportspeople wanting to take their sport to a higher level,” Mr Chester said. In 2017, Holly worked part-time to save the money she needed to play at Futsal World Championships in Orlando, Florida, as a member of the under 16 girls Bayside Pirates Futsal team. With no women’s national futsal team at the moment, Holly’s dream of playing for her country is on hold – for now. For more information on the Local Sporting Champions grant program, visit https://www.ausport.gov.au/ais/grants_and_funding/local_sporting_champions .